Power crisis has deepened in Uttar Pradesh with closure of one more unit of Anpara thermal power project due to a technical snag, prompting Chief Secretary Alok Ranjan to ask officials to find a solution to meet electricity shortage in the state. Generator transformer of unit number four of Anpara project having capacity of 500 mega watt developed snag yesterday after which it stopped power generation, UP Rajya Vidyut Utpadan Nigam Ltd Chairman and Managing Director Kamran Rizvi told PTI. He said transformer of 500 MW five number unit of the same plant developed snag on July 9 and was being repaired by Bharat Heavy Electrical Limited at Bhopal. Rizvi said it takes at least one month to get a generation transformer repaired. The transformer which developed snag on July 9 is to become operational by August 14. Due to closure of units, power generation has been reduced to 1,600 MW as against 2,500 to 3,000 MW in normal days, sources said. While the power demand has shot to 13,000 MW due to sultry weather, supply has been limited to 10,000 MW, thus leaving a gap of nearly 3,000 MW. Rostering is being undertaken across the state, including VIP areas, to balance supply availability. Chief Secretary Alok Ranjan called and emergency meeting and directed that the damage caused should be repaired immediately. He directed that find solution to meet shortage of power due to closure of the unit and said that he should be informed about the causes behind damage to two transformers within a month, an official statement said. He said that a new generator should be procured from Damodar Valley Corporation within a month and the closed unit be made operational. The UPPCL officials said arrangements were being made to tackle the situation and that the government would take 370 MW power from Jammu, Himachal Pradesh and Delhi under "banking power quota". Besides, an additional 500 MW power was being purchased from energy exchange, they said adding this is being made available from Monday itself. Meanwhile, All India Power Engineers Federation has raised questions over the government's claim of arranging additional power. Its chairman Shailendra Dubey said as of now additional power was not available in any of the state in the country. He termed the two incidents of snag in transformers as laxity on the part of the plant management and said the government's claim of being able to provide 24 hour power supply by 2016 was "hollow." Dubey said the state needed more power projects for overcoming shortages. The chairman said that at present three new projects at Bara, Lalitpur and Anpara were being installed. Anpara D may get operational by the end of this year but will not be sufficient to meet power availability, he said. He said if Bara and Lalitpur projects get operational by 2017 then it would add 5,000 MW to power generation. "By 2017 the gap between demand and supply will reach 7,000 to 8,000 MW," he said. Meanwhile, the UP BJP has blamed Akhilesh Yadav government for the deepening power crisis in the state. "The manner in which units are closing one by one is an evidence of laxity on the part of the government," BJP state spokesman Vijay Bahadur Pathak said. 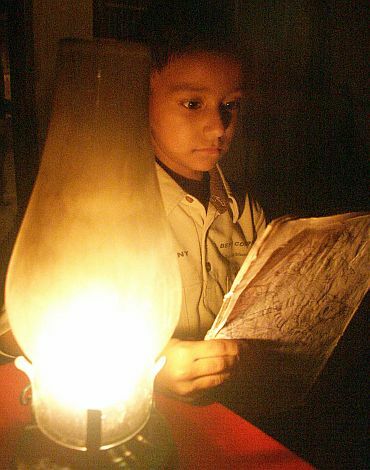 He alleged that power crisis was deepening due to lack in coordination between generation and distribution. "Despite tall claims Akhilesh government has failed to resolve power crisis in the state," Pathak said. He also demanded a probe into purchase and repair of transformers in the state.